Capable of being grown on sloping fields, without need for terracing or irrigation, maize is a vital crop on the mid-hills of Nepal, particularly among poorer families and disadvantaged groups. Maize accounts for 20 percent of calorie intake in the country, and is typically grown on small fields (average land holding in the hills is half a hectare) by families who spend 75 percent of their income on food. Harsh climate, poor infrastructure and market access and worsening shortages of labor are just some of the challenges they face, with crop yields also constrained by quality seed supply problems. In recent years, however, work by the Hill Maize Research Project (HMRP) is helping to address these constraints and having a positive impact on farm productivity. Since 1999, the project has been working with national research and extension partners, non-governmental organizations, private seed companies and farmers to develop, test and disseminate high-yielding maize varieties, support seed production and marketing, and test and promote resource-conserving farming practices. “To date, we’ve reached nearly 50,000 households in 20 hill districts,” says Guillermo Ortiz-Ferrara, CIMMYT cereals breeder and HMRP leader, “and 226 community-based seed production groups participated in the project.” Results of that work have included the development and release by the National Seed Board of seven high-yielding, disease- and drought-tolerant maize varieties, including one quality protein maize type, ‘Poshilo Makai 1’ developed by the National Maize Research Program of the Nepal Agricultural Research Council. HMRP has also introduced a number of farming systems and technologies to reduce women’s drudgery, such as grading and seed shelling machines, power tillers and intercropping of maize with ginger, tomatoes and soybeans. “Because we target women and disadvantaged groups, more farmers have adopted improved varieties and practices, and benefitted,” said Ortiz-Ferrara. Through its Gender Equity and Social Inclusion (GESI) approach, the project targets farm families suffering from caste-, gender- and ethnicity-based discriminations and have food self-sufficiency for less than six months. 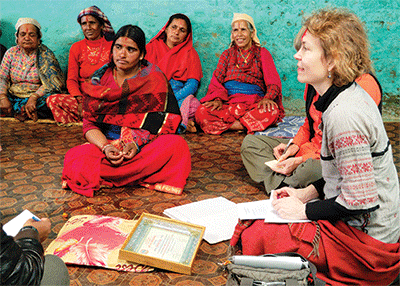 Thus, women, Dalits and Janajatis are the main beneficiaries of the project. In negotiations with seed companies, the project has advocated giving the first priority for contracts to women’s groups and groups with a significant number of members from disadvantaged groups. The positive benefits of this approach were confirmed in February 2013, through a gender audit of the CRP projects conducted by the Dutch Royal Tropical Institute (KIT) and commissioned by MAIZE. The audit found positive evidence for both a redistribution of agricultural technologies, resources and benefits in favor of women, and greater recognition of women as farmers and local leaders in the project areas. Women CBSP group members spoke of having greater access to resources such as improved maize seeds, information (through various individual and group trainings) and extension services. Some also reported increased yield and income, leading to greater financial independence and decision-making power in the household. Women also reported feeling empowered by their new capacities and knowledge, which they had been able to share with their husbands and thereby gain greater recognition. Beyond the household, members of women-only CBSP groups, in particular, reported having greater bargaining power with seed-traders. Some women’s groups successfully demanded specific services (such as training in vegetable production), from the district agriculture office and financial support for their seed storage from the district development committee. There are also examples of women’s group members being invited to join decision-making fora, such as the District Seed Coordination Committee (DSSC), in recognition of their achievements. 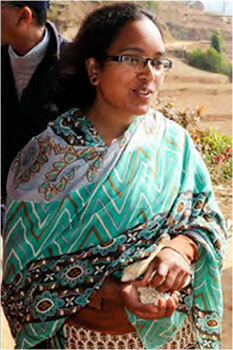 At the 2013 annual meeting of the Global Maize Program, held in Nepal, CBSP coordinators from 10 hill districts stated their interest in ‘graduating’ from community groups to having formal status as seed companies. However, marketing and transport remain key constraints. Prior to 2012, CBSP groups were not encouraged to consider market demand and supply, resulting in surplus seed in some areas and deficits in others. Therefore, the 2013 project phase initiated pre-sowing seed contracts for improved maize varieties, assisting and guiding CBSP groups and seed buyers (seed companies, agrovets and community seed bank cooperatives) to sign formal agreements. On February 5, 2013, the Tillottama Agriculture Cooperative – one of the CBSP groups – signed a pre-sowing seed contract for 2 tons of improved maize seed, with a local farming products retailer, Bhandari Agrovet. This contract is believed to be the first in the history of improved maize seed production in Nepal. Following this, the project, in coordination with the District Agriculture Development Offices and the Seed Entrepreneurs’ Association of Nepal, facilitated the signing of contracts amounting to 207 tons of improved maize seed between 52 other CBSP groups and 25 private buyers in the project area. According to USDA Production, Supply and Distribution by Market Year statistics (bit.ly/1rlvWvS), maize production in Nepal increased by 400,000 tons, or 20 percent, from 2004 to 2013. 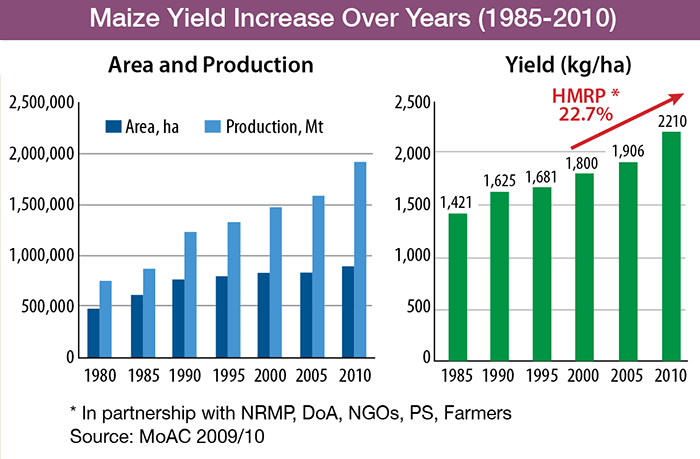 Recent research shows that HMRP increased national maize productivity by 37 percent since 2010 (www.usaid.gov/nepal/fact-sheets/hill-maize-research-program-hmrp). Chart taken from “Improving Maize Food Security in the Hills of Nepal Through Participatory Variety Selection and Community Based Seed Production,” 11th Asian Maize Conference, Bejing, China, Nov. 7-11, 2011. Because established seed companies generally do not market seed in hill areas, HMRP has supported seed production and sale by 226 CBSP groups, most of whose members are women. In 2013 those groups produced over 1,000 tons of high-quality, improved maize seed, which was subsequently marketed across the hills of the country. 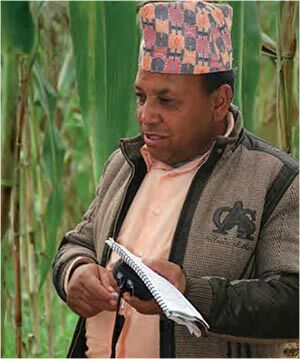 Starting in 2000 with just seven groups, the CBSPs have become a successful model in Nepal, contributing to the increased adoption of improved maize varieties and technologies and helping to ensure the availability of seed in remote areas, on time and at lower prices.